Dallying In The Dirt, Issue #224--- The delicate Martagon Lilies are blooming in the shade. We are now on our fourth day of sunshine and the garden is slowly drying out. I actually had to go out this morning and water many of the containers. I made sure they all got some fertilizer as well because the deluge of rain had certainly leached most nutrients from their soil. It’s amazing to watch how different plants adapt or in some cases don’t adapt, to the presence of so much water. Since I seem to spend an inordinate amount of time dealing with weeds, I also observe them. The wettest parts of the garden produce quite different species of weeds than do the drier parts. The very wet soil does have one advantage, it is noticeably easier to pull those weeds. 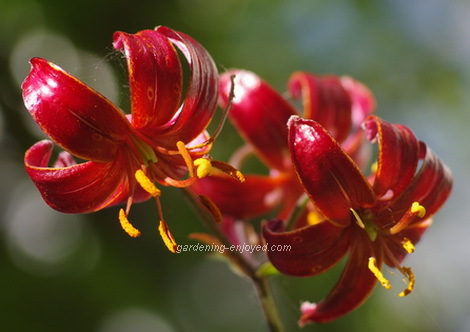 Lilies are one of my favourite flowers and I grow quite a few of them despite having to deal with the Red Lily Beetle. I manage to control most of those nasty beasts and I don’t win many prizes at the flower shows because the few that I miss eat lovely holes the foliage. There are Lilies of various sizes and shapes and they vary in their tolerance for different locations. The earliest to bloom are the Martagons. They are delicate little flowers that are downward facing and I had to lay on my back to get this picture. One of their best features is their ability to grow and bloom in the shade. This also gives them some tolerance for moist soils. Claude Shride, pictured, is a hybrid that was developed in the 70s and is still quite popular and desirable. I also have the species, alba, which is a huge magnet for those accursed beetles. The hybrids are a little less attractive to them. Attracting lots of attention in the front yard this week is my Tree Rose. This is not a commercially available item but rather something I created. 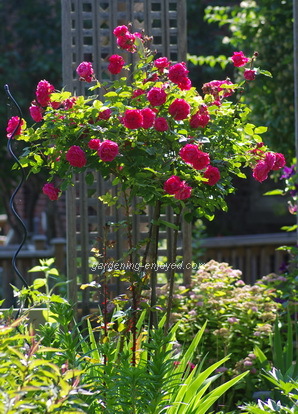 Most tree roses that the nurseries sell are hybrid teas grafted onto a shrub rose stem. They are not very hardy and require digging and protecting each winter, at least in my part of the world. Mine is a Morden Rose, I’ve long since lost the variety name, which is a series of Roses that were bred in Morden Manitoba and are able to withstand that climate. I purchased an ordinary shrub rose and pruned it to one stem and continued to do that for a couple of years. When it reached about 1.3 m (4) high, I topped it and allowed it to branch. It is supported by a piece of rebar and in the years since it has produced two more tall sturdy shoots that are also tied to that stake. Even after this very cold winter that killed many Roses, my Tree Rose has flourished and put on this amazing show. A little bit of patience and some fancy gardening tricks, yield a very desirable and interesting feature in the garden. The Martagon Lilies have flourished in the damp conditions. I cannot say the same for my Tomatoes. They are down in the lower section of the garden and if you saw last week’s “Dallying” you saw them standing in a lake for a few days. 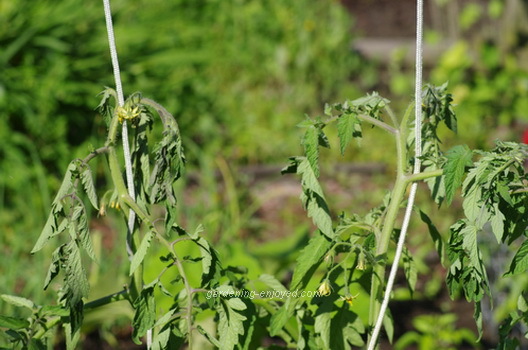 They are all now wilting badly and I noticed this morning they are developing many very yellow leaves. All that water has eliminated most of the air spaces in the soil and the Tomato plants are essentially drowning. I suspect that their roots are rapidly rotting and that absence of viable roots is manifesting itself with the wilting and yellowing. There is essentially nothing that I can do to rectify the situation but to sit back and hope for several more warm sunny days. If I’m lucky they will develop new roots as the soil dries out and we may yet get Tomatoes this year. I have a few other Tomato plants in other locations that seem to be doing much better. The ones in my Earth Box planters are doing so well that they broke the stakes and fell over. I created a new, stronger and higher, trellis for them to grow on and hopefully it will hold while we get a crop of those delicious red fruit. Ken Answers! Some of my Iris did not bloom this year either and some that did had stunted or twisted bloom stalks. I’m blaming the cold winter but that doesn’t explain why neighbours had better blooms. I’m assuming that you watch for the Iris Borer and stop it from attacking your plants. I’m cutting out any of the twisted and aborted stalks and making sure they get well fertilized this summer and then hoping for better results next year. Linda Asks? Another question! I have a Delicious variety apple tree which always stayed small. Since our big maple went in the ice storm the apple tree has really come to life in the sunshine. WHAT can you do to keep the squirrels from eating the apples as they get big? They always beat me to the few we had. My late father-in-law said to spray with water I soaked tobacco in. So I did, after every time it rained, squirrels still got apples and I smelled like a cigar. Last year I tied netting around every apple while still on the tree but that is out of the question now, too many, too high. Any help? Ken Answers! Eliminate the squirrels is the quick but impossible answer. The bushy tailed tree rats seem to eat anything that we value. Realistically you can keep the apple tree pruned to a smaller size, a good pruning will increase your yield as well, and try netting the whole tree. As much as I hate to suggest it, you could provide a more desirable food source in the hope that the squirrels would eat the offered peanuts and leave the apples alone. Good Luck, you may just get more squirrels. Monica Asks? My yard continues to be overtaken by invasive violets and the creeping vine . . . both are overrunning my grass. I live in Upstate NY. Is there anything that I can put on the lawn that will take care of both of these intruders??? Ken Answers! Both of these delights inhabit my bit of lawn as well. The violets I tend to dig out. The Ground Ivy is another problem. It can be treated with a Boron solution. I’ve tried it with varying results and it has some residual problems as well. My best solution is to keep my turf well fertilized and to cut it at least 3" long. That healthy grass helps to retard the weed’s growth. Living in NY probably allows you access to a variety of chemical weed controls that are not available in Canada and you have to decide if you want to spray your lawn with them.